This kit is was a second venture in fund raising for museums using Needlework Nibbles. 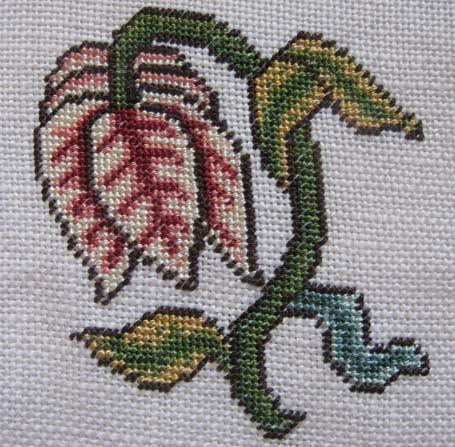 The piece is based upon a 17th century tent stitch slip that is in a private collection, a picture of the original can be seen below. The leftover 28 kits are being sold to raise funds to support the Metropolitan Museum of Art's Ratti Textile Center's initiative to show small textile exhibits in their small stairwell gallery. $10.00 of each kit will go to the Ratti Textile Center and be designated for this purpose. 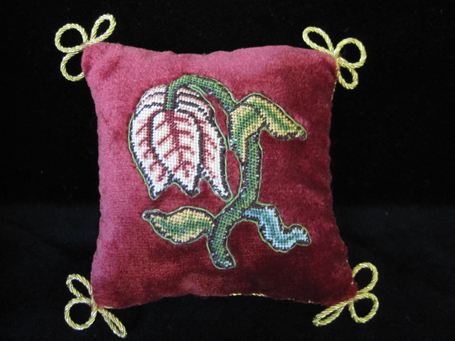 The project is faithful to the original and includes the linen and soie d'alger silk threads needed to complete the tent stitch tulip. There are a limited number of optional finishing kits to allow you to apply it to a velvet pincushion. 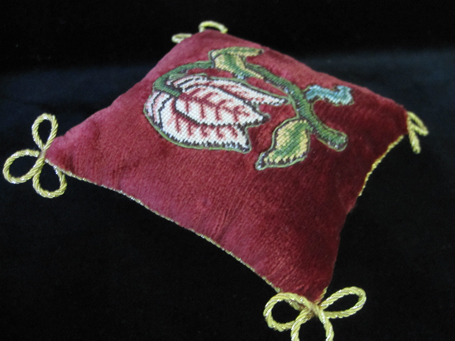 The optional finishing kit includes a piece of REAL SILK VELVET, gilt grecian twist as the edging, red silk backing, and green silk gimp to edge the slip on the velvet. The excess green thread in the stitching kit is used as a couching thread. I am very excited to now have a source for silk velvet, and this is the first time I am offering it. $5 of each finishing kit will go to the Ratti Center as well. The original run of this kit supported the Plimoth Jacket exhibit and raised several thousand dollars for this purpose! Thank you so much - the exhibit was wonderful and enabled thousands of people to see the Plimoth Jacket in person.